It was the smallest year-over-year increase of 2013, but South Mississippi managed to pull off its 17th straight month of sales tax increases in October as the local economy continues to show improvement. Six of the 12 Coast cities reported a decrease in sales tax diversion compared with October 2010, but strong sales in other cities pushed total collections up $50,285 -- a 1 percent increase over last year. Ocean Springs saw the biggest decline, down $57,400 from a year ago, followed by Waveland, which was down $15,664. Other cities that will receive smaller diversions are D'Iberville (down $7,976), Diamondhead (down $7,298) and Gautier (down $638). 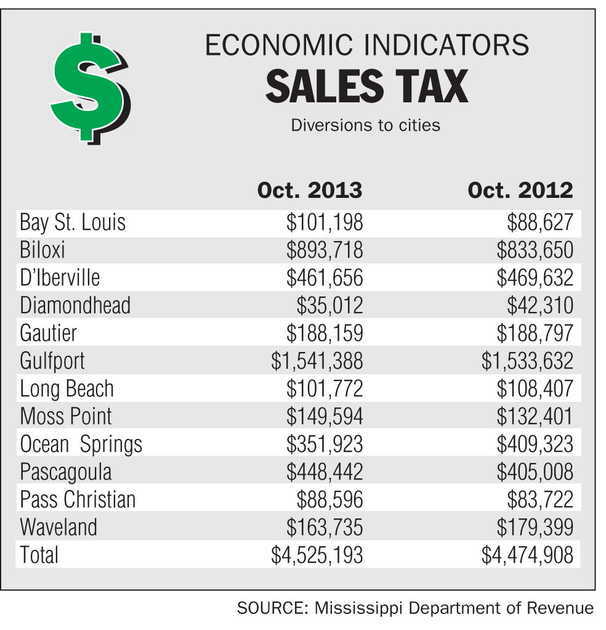 Biloxi had the biggest gains in the October report, with a sales tax diversion of $60,000 more than last year. Pascagoula continues to show strong numbers and is up $43,400 from a year ago. Moss Point was up $17,193, Bay St. Louis was up $12,571, Gulfport was up $7,756 and Pass Christian was up $4,874 compared with October 2012. May 2012 was the last time sales tax diversions were down compared with the prior year. The largest year-over-year increase was in January, when diversions were $386,000 higher. The smallest increase in the past two years was $17,328 in September 2012. Gulfport continues to well outpace the other cities in sales tax diversions, according to the reports from the Mississippi Department of Revenue. The city has $6.6 million in diversions since the state fiscal year began July 1. Biloxi is second with $3.9 million, D'Iberville third at $2.0 million and Pascagoula fourth at $1.7 million.